After the incredibly long winter we’ve had, it feels amazing to get outside and get some warm, fresh air. I guess the advantage to having such an enduring winter is the amount of practicing I’ve been able to accomplish since the new year! I set a goal for myself miss as few days of practice in 2018 as possible, and so far since January 1 I’ve only missed five days. I feel a renewed sense of accomplishment when I highlight the days I’ve practiced on my calendar. It’s easy for me to put off practice for other tasks when my schedule fills up, but making practice a priority has helped me stay in great playing shape and stay focused on the role the saxophone holds in my career. With the new season comes a new series of concerts around Saskatoon. This past weekend showcased the music of Harry Potter from the Saskatoon Symphony Orchestra, and this upcoming weekend features two more of Saskatoon’s finest ensembles, the Saskatoon Concert Band and the Saskatoon Jazz Orchestra – one of which I have the pleasure of performing with. If you don’t have plans for Saturday April 28, please consider seeing the Saskatoon Concert Band perform the music of Leonard Bernstein for the anniversary of his 100th birthday. This concert will feature a few of his greatest works arranged for concert band, including the Overture to Candide and selections from West Side Story (more details for this concert can be found on my Upcoming page). I’ve been rehearsing with the concert band since the start of April, and I’ve had plenty of fun working with everyone and reconnecting with their concertmaster, George Charpentier. It was a year ago now that I had the pleasure of performing Glen Gillis’s Elegy Cadenza with the ensemble, which brings back fond memories. Although I will not be performing with them this time around, you should also consider seeing the Saskatoon Jazz Orchestra with special guests Jeff Antoniuk and Tatrina Tai (see poster below) on Saturday night. 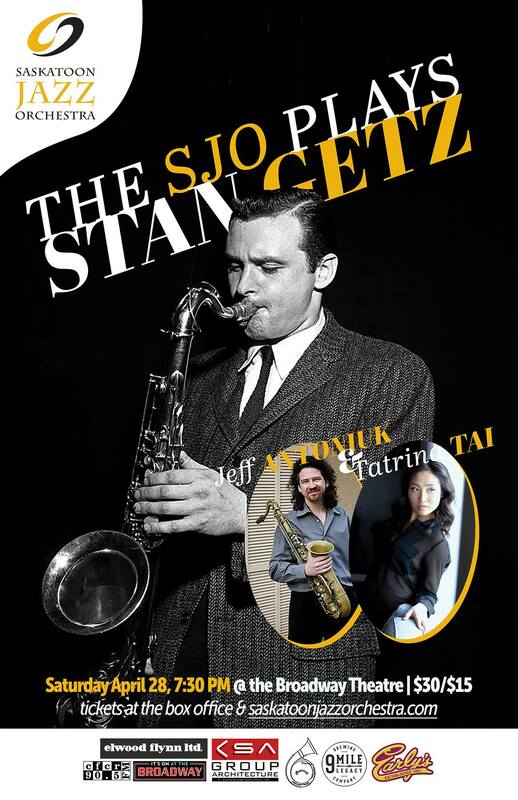 The SJO will be performing the music of Stan Getz, as well as many of the tunes that elevated him as one of the greatest tenor saxophonists of the 20th century. Originally from Edmonton, Jeff Antoniuk is one of the most active jazz saxophonists and jazz educators in North America right now. I’ve been checking out his YouTube videos lately on jazz pedagogy and his process as a teacher, and it is very clear that he is passionate about teaching to the best of his ability. Whatever you decide to do this weekend, I hope you consider checking out either one of these fantastic concerts and supporting live music in Saskatoon!